The Kennington Park Estate Tenants’ and Residents’ Association aims to act in the best interests of all residents of the estate and its representatives work hard to achieve this. Hyde Southbank manages the Estate and our rents and service charges pay for the services they provide and manage. It is important that we are all able to have a say in how these services are provided and whether we are getting value for the money we pay. Scheduled meetings, to which all residents are welcome, are held five times a year; additional meetings may be called to deal with urgent matters. The Tenants’ and Residents’ Association is usually just known as ‘the TA’ (not to be confused with the Territorial Army!). An Executive Committee comprising elected officers and representatives from each of the 12 blocks on the Estate runs the Association collectively, organising meetings, agreeing items for discussion, and liaising with our landlord, Hyde Southbank, or other relevant bodies such as Lambeth Council, on behalf of residents. Members of the Executive Committee accompany Hyde officers on estate visits, scrutinise the service charges we pay and constantly strive to ensure the services we receive are value for money and professionally delivered. 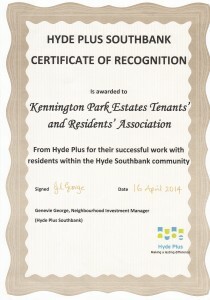 In July 2017, the Association was granted a Licence to Occupy Kennington Park Community Centre and is now responsible for managing it jointly with the Hyde Foundation.